"HP ePrint lets you print from virtually anywhere. One of the ways that ePrint works is to assign an email address to your printer. To print, simply send an email containing your document to your printer's address. You can print images, Microsoft Word, Excel* and PowerPoint documents, PDFs, and photos. Note: .... Documents printed with ePrint may appear different from the original. Style, formatting, and text flow may differ slightly from the original document. For documents that need to be printed with a higher quality (such as legal documents), we recommend that you print from the software application on your computer, where you will have more control over what your printout looks like." Sending a print job via the internet is not new technology, but HP's ePrint service raises the ante by simplifying the process, and by signing on content providers such as CNET, USA Today, and Google Maps in hopes of increasing the desirability and usage of the service. Indeed, while HP mentions the ability to store documents in "the cloud" for later printing, most of the emphasis appears to be on the "Print Apps" which provide "Instant access to relevant, printable web content from your printer screen," and appear to be primarily home or family based in their appeal. To utilize the service you need a HP printer with ePrint capability, and you must create an account, which will assign a random e-mail address to your printer. A typical Print App will then allow you to print content such as a Google map, a daily news summary, or perhaps a page of coupons. If the service catches on, HP would realize an increase in printer sales, and - perhaps more significantly - an increase in profitable printer ink sales. However, given the popularity of smartphones, netbooks, and tablets (Apple or otherwise), I would question how many people are clamoring to have more printed pages as opposed to having content sent to (or natively available on) their portable device of choice. 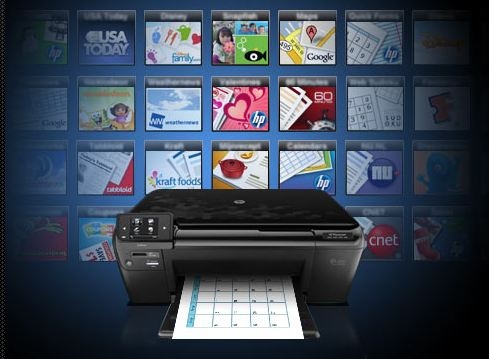 Does HP's ePrint service seem significant enough that you would be willing to base your next printer purchase upon it?